Do you suffer from some degree of hearing sounds ? Do you always ask people to repeat what they say? Do people always try to talk loudly when they’re with you? Are you tired of the silence? hearing problem, these small hearing aid devices are the best and most effective solution. Try them out and see for yourself! Is there noise where you’re at right now? Do you want to converse with someone? Don’t worry, you won’t have trouble hearing them. technology of the hearing aid devices automatically suppresses low noise distortions, so you’ll have clear sound of the voices you want to hear. so you will always be comfortable while you wear them. YOU CAN HEAR EVERYTHING: Do you always ask people to repeat what they said, but a bit louder? Whether you have hearing problems due to your age, or due to stress or some kind of dysfunction, the Easyuslife hearing amplifiers will help you hear again. The small hearing aid will allow you to have normal, flowing conversations, since you will not constantly have to interrupt someone to ask them to repeat their words. 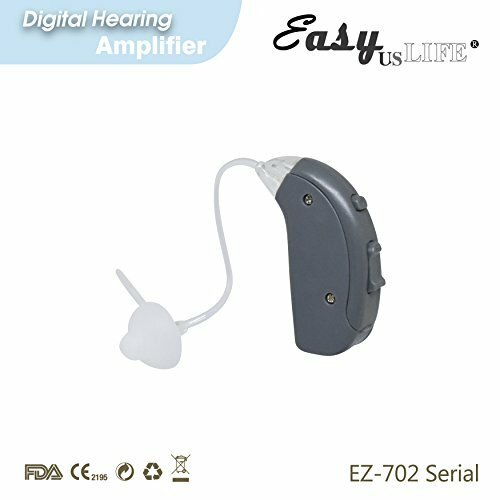 NEW ADVANCED DESIGN: After continuous research and tests, Easyuslife has designed and updated and upgraded version of the hearing aid earplugs. This technologically advanced hearing amplifiers with the digitally enhanced quality are the best ones on the market. Our earplug amplifiers even have a low noise distortion function, so every time you wear them, you will be able to focus and hear the voices of the people who talk to you and with you. EASY TO OPERATE: This may be a technologically advanced hearing aid system, however, it is incredibly easy to wear and operate. Thanks to the digital volume and mode control, you can easily change the volume of your hearing amplifier based on the environment that you're in. You can also choose between high, medium and low frequency. And if you need to change the batteries, this procedure is just as easy! Easyuslife is here to make your life easier. UNDENIABLE COMFORT: You probably want to wear the hearing amplifier for many hours throughout the day. Having this in mind, Easyuslife has made sure that the ear plugs of the hearing aid devices are super soft, lightweight and comfortable. In addition, the two hearing amplifiers have fixed tubes, so one device is for you left ear and one for your right. In this way, you will always have the most secure and comfortable fit and your ears won't feel sore when you remove the amplifiers. A RISK-FREE PURCHASE: Here at Easyuslife we're very confident about their quality, practicality, efficacy and durability of our hearing amplifiers. We know that the hearing aid earplugs will make your life much easier and happier. We're very proud of our hearing device and for this reason we have backed it up with a 1 year warranty. So if your hearing amplifier doesn't work or seems to malfunction, we will repair it or replace it with a new one. Isn't that great?